In other words, BURN is way cool! BURN is a project that has surprised all of us by the amount of attention it has received at this early stage. I continue to be pleased that it has captured the imagination of so many. 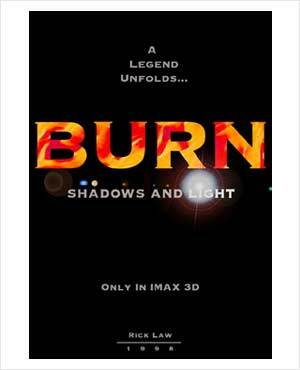 The stories of BURN are ones that explore and examine that thin razor sharp horizon where darkness meets the light. They are conceived to be stories, or rather a continuing story of the duality that exists and battle all around us. Love and Death. Joy and Tragedy. Passion and Apathy. The emotions and influences that affect us all. My hope is that the stories may provoke you to ask questions of yourselves while providing enlightenment and enjoyment. When I created BURN, it was using a soap-opera model, in that every time you, as the viewer or reader, are comfortable with the characters and events and think you know what is happening, an unexpected twist should arise. Thus, everything is not always as it appears.